Here’s a fun fact about me, I’ve been around construction tools and machinery all my life. My dad is a Master Carpenter and General Contractor so I’ve pretty much seen power tools evolve over the last 20+ years. I even remember his first cordless drill, which barely had enough power to drive a screw without pre-drilling. So this months favorite tool is the Bosch PS40-2. The Bosch PS40-2 is a 12-volt Lithium-Ion Impact Driver that is very well balanced, light weight and very powerful. If you have never used an impact driver, you’re in for a treat. The sound of it “impacting” when driving a screw or bolt is normal (some think the sound is a defect). Don’t judge it by it’s compact look this drill is a monster… it’s small enough to carry with your and use in tight places but powerful enough to drive a screw without drilling. The battery life is also great… I typically charge it and can use it for the full day before needing to recharge. Just keep in mind that this is a driver, not a typical “drill” so if you want to drill something this isn’t the best tool for the job. 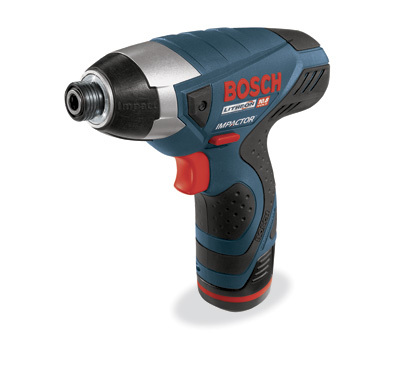 Bosch offers a PS30-2A (drill/driver) for that kind of job. – Delivers 1,800 RPM/3,000 BPM with 60 per cent more torque than 18V drill-driver; 800 in.-lbs of max torque. – 3 LEDs illuminate work area for use in dark areas. – Aluminum gear housing with protective rubber front and a 1/4″ hex drive with quick release. – Ergonomic Soft Grip Handle; bumpers on side of tool. The Bosch PS40-2A also will make a GREAT father’s day gift!